British security services have identified a suspect involved in the ISIS-backed train blast in southwest London Friday, per Reuters. The explosion took place around 8:20 a.m. local time at the height of rush hour on Parsons Green District line, a busy commuter train. 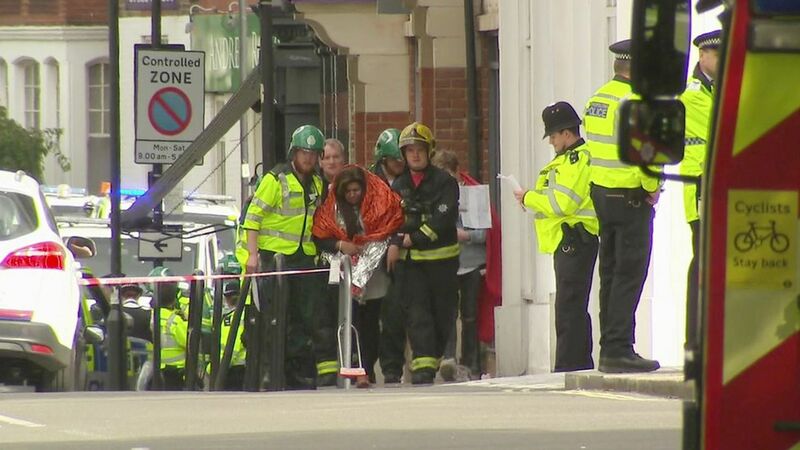 At least 29 people were hospitalized in relation to the attack, which is being investigated by Scotland Yard's counter-terrorism command, SO15. On Friday evening (local time), Prime Minister Theresa May raised the U.K. terror threat level to "critical" after initially stating that the level would remain at "severe." May added in her televised statement that there will be a heavier police and military presence on the streets in the coming days. President Trump said Friday that the attack was "a terrible thing — just keeps going and going" and reiterated his earlier comments suggesting the government has not been tough enough when cracking down on terrorism: "We have to be tougher. We have to be smarter." Bottom line: This marks the fifth major terrorist attack in the U.K. this year. Photos from the scene reveal a fire inside a shopping bag in a white bucket inside a train cart. One passenger told the UK's Press Association he heard a "boom and when I looked there were flames all around." Police said the improvised explosive device did not fully explode, but was meant to explode further. Prime Minister Theresa May tweeted: "My thoughts are with those injured at Parsons Green and emergency services who are responding bravely to this terrorist incident." Trump tweeted: "Another attack in London by a loser terrorist.These are sick and demented people who were in the sights of Scotland Yard. Must be proactive!" The mayor of London, Sadiq Khan said the city "will never be intimidated or defeated by terrorism."